If you asked most people what The X-Files was about, they'd probably say something about aliens and conspiracies and monsters of the week. 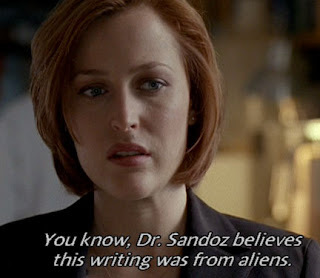 If you asked me, I'd tell you The X-Files was about Acid, Abuse and Ancient Astronauts. Why the discrepancy? Well, most people look at the surface elements of the series, whereas I look at the subtextual narrative, often expressed in mythological symbolism. Now to clarify, by "Acid," I mean visionary and shamanic experience, hallucinogenic and otherwise, which was an integral part of the series from very early on. But I also mean DNA, itself an acidic compound. By "Abuse," I mean the constant undercurrent of child abuse- systemic or intimate- that lurks beneath all of the alien abductions and tests and the rest. The very first episode is about children being abducted and abused, as is the Mythology of Samantha's abduction (and certainly its resolution in Sein Und Zeit/Closure). 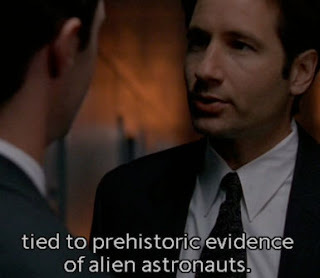 That resolution ties back to an earlier episode called Red Museum, which deals with hallucinogens, ancient aliens as gods and DNA manipulation, all of which is exposed by the actions of a sexual predator. Both stories hinge on the concept of "Walk-Ins," a type of spiritual intervention popularized by UFO cults in the 1970s. 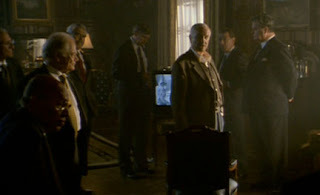 I always saw the aliens in the first six seasons of the series (the "Colonization" storyline) as a metaphor for the Nazification of America, since the Syndicate conspiracy was headed by Conrad Strughold, a not-so-thinly-veiled stand-in for Hubertus Strughold, the Nazi/NASA founding father who used mescaline in many of his horrific experiments at the Dachau concentration camp. He became two characters on The X-Files (Conrad Strughold and Victor Klemper), both of whom are introduced in the episode Paper Clip, which was based not only on the Nazi-importing program of the Cold War, but was the third installment of a storyline that dealt explicitly with Pueblo shamanism. Though not seen until the first XF movie, Strughold owned the mines in West Virginia (which we'll get to later) where DNA of alien abductees was being stored. Hallucination and visionary experience is tied intimately into alien identity and AAT throughout the series. An early episode called Space had a Colonel Marcus Aurelius Belt, a former astronaut in charge of the Shuttle program, experiencing hallucinations of the the Face of Mars. It's later revealed that Belt was being controlled psychically by aliens to sabotage the space program so that humanity couldn't leave the biosphere and would remain ignorant of ancient civilizations in the Solar System. 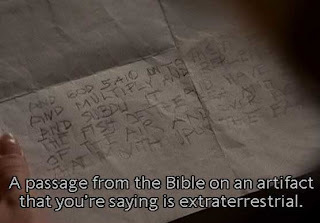 That's part of the surface narrative of The X-Files. It's what lies beneath the surface that may be more enlightening. Through the series, episodes centered alien identity and AAT would be preceded by episodes dealing with either hallucinations and/or hallucinogens. The first explicit inclusion of AAT in the Mythology was The End, which was preceded by an episode about an insectoid vampire (nearly identical to the ancient Martians from Quatermass and the Pit) that disguised its appearance by psychically implanting a hallucination of itself as human in the observer. The major revelations of Biogenesis/The Sixth Extinction (with "Dr. Sandoz" and his revelatory "alien tablets") was preceded by the giant magic mushroom in Field Trip, as we looked at previously. 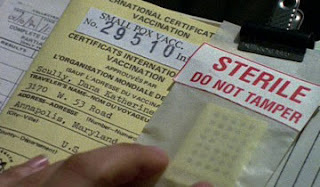 The episode in which we first saw Scully's baby (conceived following her exposure to ancient alien technology) was produced right after Via Negativa, an episode about a Iboga guru who kills his victims in their dreams. 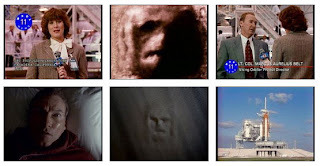 William's alien identity was explored in two separate arcs: in TrustNo1, aired after Lord of the Flies which had a Syd Barrett subplot, and in Providence/Provenance, preceded by Hellbound which dealt with hallucinations of murder victims. Ancient mythological symbolism was used throughout the series, eventually reaching a point where a careful observer might come to believe that the writers believed that the ancient fables trace their roots to human/alien contact. Certainly, all of the major characters would explicitly express a belief that humanity was the result of alien intervention in primate evolution, perhaps even in the terraforming of the Biosphere itself. 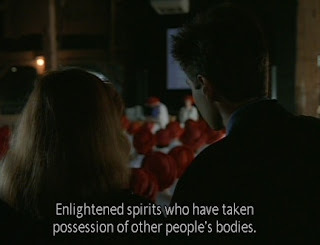 It was never certain if the genetic engineers were the same as the Colonists, since their human/alien replacements were puzzled by the genetic structure of Scully's alien baby (see Essence/Existence). Weaving throughout all of this is androgyny and psychic ability, since both are part of the alien dreaming and the Mythology throughout the series. As early as the first season, aliens were shown to be shapeshifters who could change genders. And the smoking gun of the alien component of human DNA was telepathy, which was first explained in The End. 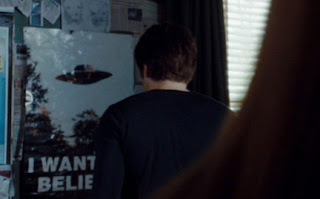 So what does all of this have to do with the last X-Files feature film, I Want to Believe? It has everything to do with it- you just have to know how to look.